I’m just such a sucker for tags, cards and anything texty/graphic. Aren’t these cute? 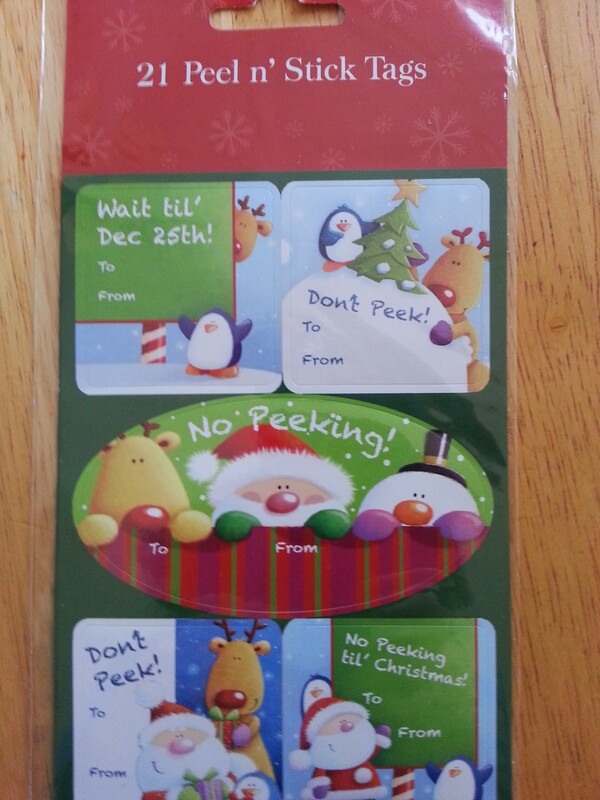 “No Peeking!” Love. Anyhoo. The other freaky thing about this cart was that I reached for a Barbie, thinking I could give it to my 2 year old in the future, and it was the exact same Barbie that she already has. She only has one thus far. Then, I reached for some cookie cutters in a mesh bag, and they were the exact same ones I pulled out of my baking cabinet the other day when I was cleaning it out. Unused, still in the bag. Ones that someone gave me and I have never used, because I have another set. It was like the universe was trying to remind me to STOP BUYING STUFF, YOU HAVE MOST OF IT ALREADY. What I stopped in ShopRite for was frozen cauliflower and a rotisserie chicken. Lately I am making peace with the fact that my kids and husband are super picky and that I am not a great cook. So I am focusing on keeping meals simple, easy and somewhat healthy. I cooked and pureed some cauliflower and hid it in chicken broth a la Jessica Seinfeld, added some pieces of chicken and some tortellini, and voila! Something the kids ate rather voraciously. Well, the boys wouldn’t allow the chicken or tortellini in their broth, so they got conchigliette (fancy word for shells) pasta. A good meal for a chilly night. My daughter ate three bowls and picked up the bowl to drain it at the end, God love her. I used to make that meal fairly often but I hadn’t in a while. In fact I used to sneak cauliflower into quite a few things, then got lazy about it. The whole Jessica Seinfeld system is neat if you can make the time for it. As I always do, I made way too much pasta. So I have to try to remember to make use of the leftovers somehow. As I mentioned, food waste drives me crazy, and I’d really like to see my grocery bill come down.